Bryan Duffy, of the 3900 block of West Belmont Avenue, aroused suspicion Sunday morning when he was spotted digging around in flower pots along the marathon route as thousands of runners hit the pavement on North State Street, prosecutors said. COOK COUNTY CRIMINAL COURTHOUSE — A Chicago real estate agent being chased by police on Sunday dashed onto the Chicago Marathon route and ran a portion of the famed race before being tackled to the ground by police, authorities said. 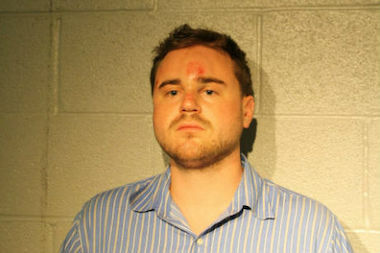 Bryan Duffy, 29, allegedly joined a pack of runners — and bumped into several of them — after police began chasing him on State Street, which is near the start of the marathon route, prosecutors said. Officers wanted to talk to Duffy, of the 3900 block of West Belmont Avenue in Avondale, after he was spotted digging around flower pots along the route, prosecutors said. When officers approached, Duffy ran away and joined the runners, prosecutors said. Officers caught and tackled him to the ground in the 200 block of West Superior Street, according to a police report. In court, during a brief hearing Monday, Duffy's face revealed apparent road rash. Officers found an Altoids box with 10 capsules of suspected MDMA (also known as ecstasy or Molly) and a wad of bills totaling $531, according to a police report. Duffy was arrested and charged with possession of a controlled substance, resisting arrest and reckless conduct for putting marathon runners in danger, according to the report. A Cook County judge set Duffy's bail at $10,000 Monday.